It's rhubarb season in the Midwest! I'm not really a fan, but my husband loves it, so I bought a plant a couple years ago and it is finally producing enough to do something with. 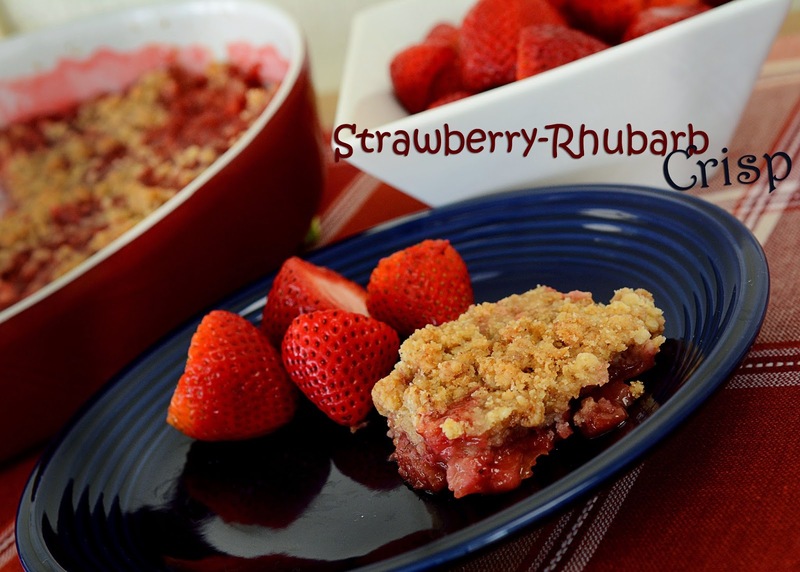 I saw a recipe for Strawberry-Rhubarb Crisp and decided to give it a whirl. I thought if it included strawberries, then I might like it and I did! I even made it with only rhubarb one time and it was still delicious. When I have ripe strawberries in my garden, I'm going to try it with only strawberries. If you do this just add 4 Cups of strawberries or rhubarb, whatever you choose to use instead of 2 cups of rhubarb and strawberries. In a bowl, stir together the strawberries rhubarb and sugar. Pour in a 2 qt. greased baking dish and set aside. Melt butter in a large microwave safe bowl. Stir in flour, oats, sugars, cinnamon and salt until well blended and moistened crumbs form. Spoon the mixture over the top.